Hillsdale was once known as "a City of Homes." Many gorgeous older homes have been torn down or otherwise removed in the name of progress. Manning Street between Railroad—now Carleton Road—and Bacon was a perfect example. The lovely Miner Kessler Funeral Home, on the southwest corner of Bacon and Manning, was first remodeled, then torn down for a used car lot. Today it is a city parking lot. The home of Dr. Walter H. and Harriet Mitchell Sawyer was next door to her parents' home on Manning. They were generous community benefactors, following the example set by her parents. Their home was torn down for an auto dealership and is today the location of the Hillsdale Community Library. 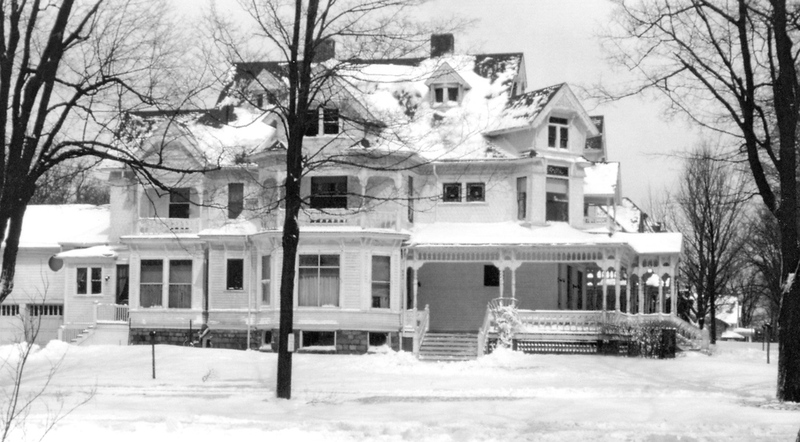 The elegant Sutton home, on the northwest corner of Manning and McCollum, was torn down for the Michigan Bell Telephone office in 1941. Each side of Manning, in this area, held four or five houses. Below, Katherine Lyons, with the Sutton dog Chum, stands across the street from what became the Hillsdale Daily News block. The houses directly behind Kate included the Dibble/Speer home and the corner home ofR.W. Sharp. It is said that every Saturday night in the Dibble duplex "great-uncle Frank Speer took a bath with his pet monkey”! All are now gone. Two of the earliest homes in this area were on the west side of this block. The John Potter Cook home, later that of Frank M. Stewart, and the duplex of George Underwood were among those in what was once considered a wilderness. These grand homes were torn down for a city parking lot. The parking lot is now owned by the Elks' Club. Just across the street was the Gridley home, which later served as the Presbyterian Manse. This was where Ann Gridley, Civil War nurse and "mother" of the Hillsdale DAR, raised her two sons, including Capt. Charles "You may fire when you are ready …" Gridley of Spanish-American War fame. The house was torn down for a car dealership, but instead became another parking lot. Originally belonging to William Waldron, brother of Henry next door, the home became the Hillsdale Hospital after passing through the hands of various Waldron family members. With the building of the current hospital in 1939-40, it became the Sanderson Hotel. After years of deterioration, the building burned in the mid-1970s and is today parking for Hillsdale Place, commonly known as the High Rise.